CathSoc Night is the main mid-week student gathering at the Chaplaincy, taking place each Wednesday after the 7:00pm Mass (so at about 7:30pm). We gather for a shared meal, talk (at about 8:00pm) and discussion, and then conclude with prayer (at about 9:00pm). You are very welcome to come along for as little or as much of the evening as you like, and it is not unheard of for discussions to continue afterward in a local hostelry! On Wednesday 21 October we welcome fr. Nicholas Crowe OP of St Dominic’s Priory, London. fr. Nick will be addressing the question, Who are these robed in white, and whence have they come? He’ll be talking about the Dominicans (the religious order to which the Durham Chaplaincy is entrusted) and how you might get involved… even without becoming a friar or sister! fr. 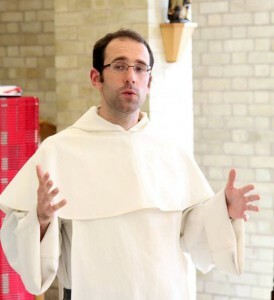 Nick, who is Vocations Director for the Dominican Friars in Great Britain, will be staying with us for a few days and will also preach at Masses on Sunday 25 October.